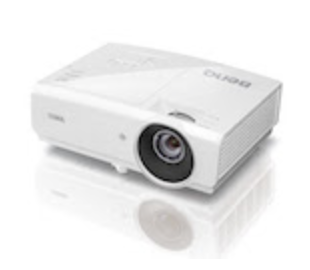 BenQ America Corp introduced a new projector to its professional business-class lineup. The BenQ MH750 Colorific projector delivers vivid color, high brightness and flexible connectivity options, making every presentation pop in any setting. "The impact of a presentation can quickly go south without the right projection," said J.Y. Hu, vice president, business line management at BenQ America Corp. "With the BenQ MH750, we engineered a cost-effective projector with high brightness in mind. The combination of picture quality and MHL connectivity make it an ideal projector for any meeting room or classroom. With built-in LAN control, it can easily be monitored and managed over the network, simplifying facility-wide maintenance for IT managers." The BenQ MH750 boasts full HD (1920 x 1080p) resolution, 4500 ANSI lumens of brightness and a 10000:1 high contrast ratio. This allows every text, graphic and video to be projected with the clarity and sharpness needed to keep viewers engaged and focused on the presentation. This value projector also features dual HDMI inputs, ensuring convenient and flexible switching between two inputs, as well as MHL connectivity, allowing users to stream content from any smartphone or tablet instantly. For full HD wireless streaming, the optional QCast harnesses the power of near-field communications (NFC) technology, allowing users to easily stream 1080p multimedia content from their smart devices. Presentations are further supported by crisp audio performance from the built-in 10-W speaker. With the BenQ MH750, integrators are able to meet the demands of any installation through the projector's 1.3x big zoom feature, corner fit, as well as 2D and auto vertical keystone correction. Together, these features provide integrators the flexibility to install the projector anywhere with ease. An upper lamp door allows for quick and accessible lamp replacement. For facility-wide maintenance, LAN control enables efficient remote monitoring and control directly from a central location. IT managers can easily perform network management tasks such as powering off, adjusting settings, monitoring lamp hours and updating firmware. The projector features BenQ's world-leading SmartEco technology, which automatically adjusts lamp power to deliver bright images to conserve the life of the lamp, as well as energy savings of up to 70 percent without any compromise in picture quality. To further reduce power consumption, an "Eco Blank" mode allows users to blank out the screen whenever projection isn't needed, while a "No Source Detected" mode automatically reduces power consumption to 30 percent when no source has been detected for more than three minutes. With the "Auto Power Off" function, the projectors automatically shut down when not in use for 30 minutes. When inactive, they keep power consumption to a minimum, <0.5-W standby power, for even more energy savings.